1. (2.09) “Winner Takes All” – In this penultimate episode, Civil Service employee Aafrin Dalal sets up his plans to elope with the sister of his employer Ralph Whelan, Alice Whelan Havistock and rescue her from her abusive husband. Meanwhile, Ralph fails to become India’s next viceroy. 2. (2.04) “The Empty Chair” – While Aafrin and Alice conduct their affair, the former’s sister, Sooni Dalal forces him to reveal his involvement in the Independence Party and the murder of a fellow activist named Kaira. Meanwhile, Ralph’s wife, Madeleine Whelan organizes a fashion show for the Royal Simla Club. And Lord Hawthorne becomes the target of a violent act and suspicion falls upon a local woman named Leena Prasad, whom he had hired as his children’s nanny and toward whom he has lustful designs. 3. 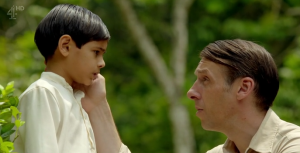 (2.06) “A Gift For the King” – While the British prepare for their picnic to commemorate King George V’s Silver Jubilee, a violent Independence Party activist named Naresh Banerjee plots to deliver a deadly bomb to the event, using an innocent orphan named Chota Matthew. 4. (2.05) “Hide and Seek” – Aware that his illegitimate son, Adam had attacked Lord Hawthorne to protect Leena, Ralph arranges for the former to be sent to Delhi to avoid arrest. However, missionary Dougie Raworth is unable to dissuade Leena from taking the blame. Meanwhile, Ralph learns the truth about his parentage from his mentor, Royal Simla Club owner Cynthia Coffin. 5. 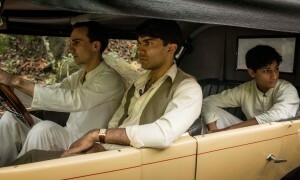 (2.10) “Leaving Home” – Alice and Charlie Havistock prepare to leave India for good, after he prevents her elopement with Aafrin. 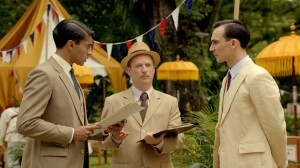 Ralph and Aafrin make momentous decisions about their careers. Cynthia is in a bidding war as the Whelans’ Simla home, Chotipool, goes under the hammer.